Freeways are highways with no tolls and with on-ramps and off-ramps. They provide the primary means of transportation for many urban areas including the Golden State. 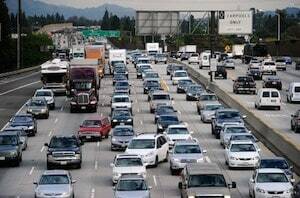 In metropolitan communities, freeways can consist of three, four and even five lanes of traffic, which can include high occupancy vehicle (HOV) lanes, commonly called “car pool lanes.” It is estimated that one-third of the land area in Los Angeles County is covered by freeways and thousands of people use them to travel every day. The main thoroughfares in the City of Angels are the 101 (Hollywood Freeway), the 5 (Santa Ana Freeway), the 10 (San Bernardino Freeway) and the 210 (San Gabriel Freeway). Because of the large number of freeways accessible and the sheer volume of traffic on each one, it is not surprising that many (if not the majority) of traffic collisions occur on one of these major thoroughfares. Traveling too fast – This does not only refer to drivers who violate the posted speed limit, but also to drivers who travel too fast to be safe in current traffic conditions, weather conditions, or roadway conditions (a violation of California Vehicle Code section 22350). Following too closely – Commonly known as “tailgating,” this is a driving behavior common to impatient or aggressive drivers on the freeway (and is a violation of California Vehicle Code section 21703). Unsafe lane changes – This can include failing to look before a driver changes lanes, swerving in and out of traffic, cutting off other drivers, crossing double yellow lines, passing on the shoulder, and similar actions. Distracted driving – Many drivers on Los Angeles freeways attempt to multitask and engage in distracting activities behind the wheel. This can include texting or using a handheld mobile device (a violation of California Vehicle Code section 23123.5), talking on the phone, eating or drinking, personal grooming, and more. Impaired driving – Driving under the influence (DUI) of drugs or alcohol on the freeway may not only land a driver in jail but also often causes serious collisions. Impaired driving can cause a driver to swerve out of their lane, travel too fast or too slow, drive the wrong way on the freeway, and more. Defective vehicle – In some situations, a driver has no control over a collision because their brakes, tires, steering, or other important vehicle parts suddenly malfunction. In these cases, the manufacturer may be held liable for negligently selling defective parts. The above are only some examples of the many possible causes of freeway accidents and the resulting serious injuries. Victims of freeway accidents are often entitled to substantial compensation for their losses from the party responsible for causing the accident. Victims of freeway accidents often sustain devastating injuries and incur substantial losses. At the Steven M. Sweat, Personal Injury Lawyers, APC, our team has decades of experience representing the rights and interests of accident victims in and around Los Angeles, including freeway accidents. These cases can often be complex and can involve significant amounts of potential compensation, so you want an attorney on your side who has the resources and litigation experience to successfully pursue the recovery you deserve. If you have been in a freeway accident, please do not hesitate to call our office today at 866-966-5240 for a free consultation.